Amid knee-slapping and beer-drinking, Germans greeted US President Obama with rapturous applause as he opened the G7 summit in Bavaria at the weekend. Obama was addressing the crowds in a public square in the historic town of Krün on a sunny morning; with the Bavarian mountains serving a splendid backdrop. Alongside him was his «great friend Angela». Merkel, the German chancellor, was beaming smiles at every jocular quip from the American president, as if the American NSA spying on her personal communications never happened. Obama was on a charm offensive, talking of the «shared history between Germany and the US», and lauding the past «great contributions» from German immigrants in the nation-building of America. He did briefly mention «the war» – but only fleetingly and in the context of postwar German national progress and the formation of the «successful NATO military alliance». Obama interspersed his lines with folksy references to quaffing a few beers and jokingly expressed his preference for holding the G7 leaders’ meetings over the next two days in the outdoors of a beer-garden to enjoy the sunshine. 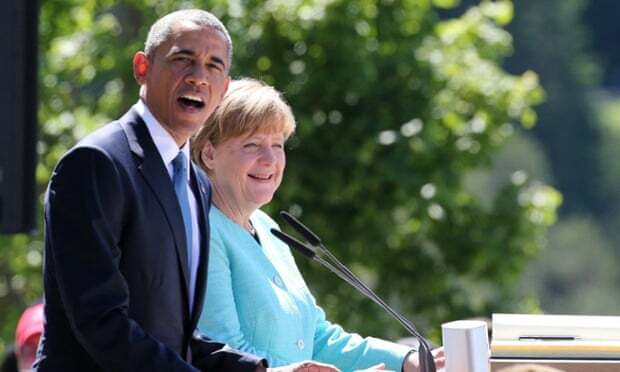 Obama’s charm offensive towards Germany is understandable. He needs the country’s backing to extend the economic sanctions against Russia that Washington has corralled the European Union into adopting. The sanctions were applied back in March last year following the reunification of Crimea with Russia, or as the West contends, after Moscow «annexed» Ukrainian territory. The harmful repercussions from this trade war has left a growing number of EU states increasingly wary of the US-led policy. No more so than among German manufacturers, farmers and other businesses who have seen incomes plummet due to the block on trade with Russia. Without German support for the Washington-led policy of sanctioning Russia, the US-EU «united front» is in danger of collapsing. The same goes for the US-led NATO military alliance. That’s why Obama was so keen to ingratiate himself and his country with the German public at the weekend, portraying the pairing as a postcard-picture of «friendship». As the pretty Fraüleins, with their plaited hair, together with their strapping menfolk, wearing feathered caps and lederhosen, applauded Obama’s rhetoric the scene conjured memories of a previous era when Germans were similarly captivated under the spell of another demagogic leader. This was Bavaria, the homeland of Adolf Hitler, whose rhetoric and nostrums were likewise apt to make the crowds swoon. Fair enough, Obama hasn’t the overt neuroticism of Hitler, nor the fiery ideological extremism. But there is, nevertheless, an unerring consistency in how a German public can seem so gullible and pliable to rhetoric that is fundamentally, dangerously, misleading. Obama in his bonhomie, avuncular style slipped in an outrageous Big Lie into his public address in Bavaria at the weekend. He cited three challenges facing the leaders of the G7 – the world’s nominally most powerful economies. Obama said the challenges comprised «Russian aggression in Ukraine», the terror threat of Islamic extremism, and global climate change. Moreover, the aggression in Ukraine that threatens to blow apart the tenuous Minks ceasefire is all down to the violations by the Neo-Nazi Kiev regime that Washington levered into power through an illegal coup d’état last February. Over the weekend, more civilians were killed in shelling of Donetsk city and surrounding towns in eastern Ukraine. These violations are US-backed war crimes, yet Obama holds forth on non-existent «Russian aggression». Elsewhere in the world, as Obama was addressing his captive German audience, American-complicit war crimes were being perpetrated with a sinister normalcy. The American-backed Israeli regime reportedly launched air strikes on the de facto open-air concentration camp of Gaza, with the usual diplomatic collusion of Washington and military support from US warplanes and bombs. In Yemen, the US-backed Saudi bombing of that country continued apace, adding dozens more civilian victims to the death toll of thousands since the blitzkrieg began on March 26. The United Nations estimates that 80 per cent of the Yemeni population – some 20 million people – are now facing desperate shortages of food, water and medical aid from the US, Saudi-imposed naval blockade of that Arab country. In Afghanistan, the Washington campaign of assassination by aerial drones claimed another 15 victims at the weekend with a strike on the eastern province of Khost. In Iraq, several Iraqi soldiers and Shia militia were killed in a US air strike near Fallujah in what was reported as «friendly-fire». The American bombing of Iraq and Syria is supposedly aimed at the ISIS terror group of Islamic extremists whom the US, Saudi Arabia and NATO member Turkey have covertly «incubated» and fuelled, according to the Guardian’s Seumas Milne, in their machinations of illegal regime-change operations across the Middle East. If there is one country that poses an existential threat to world peace from stoking state and non-state terrorism and outright geopolitical tensions with Russia and China it is the regime in Washington, whose figurehead Barack Obama swans around the globe spouting asinine rhetoric. All people of the world must recognise the Big Lie that is continually pumped out by Washington and its European puppets. This audacious falsification of reality – blaming others for the litany of crimes that Washington itself is responsible for – is endangering the world by precipitating even more conflict and possibly an all-out global war between nuclear powers. After the Second World War, the German nation professed that they did not know about the massive crimes that were being carried out by Hitler’s Third Reich. While they were applauding his speeches, dressed in lederhosen, plaited hair and quaffing beers in public squares, they would later lament: «We did not know that millions were being exterminated». This weekend, the German public were similarly applauding Obama as he foisted a pile of ludicrous lies and propaganda in their midst. And yet, all the while, American war crimes and crimes against humanity were being committed unabated all around the world. Germany has an onerous responsibility in Europe to call a halt to Washington’s war machine. Are Germans once again going to tell us someday in the future: «We did not know»?